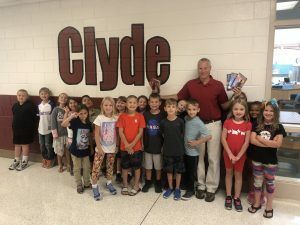 Home / School News / Congratulations Mr. Drury for being selected as a winner of the James Patterson and Scholastic Bookclub Giveaway! Congratulations Mr. Drury for being selected as a winner of the James Patterson and Scholastic Bookclub Giveaway! Mr. Kevin Drury was selected from 127,000 teacher applicants to be awarded $500 and 500 bonus points to be used for buying classroom books. Congratulations and Happy Reading Clyde Cardinals!